Nassau County Legislator Richard Nicolello recently secured $30,000 in community revitalization funds to purchase bunker turnout gear and a thermal imaging camera for the Manhasset-Lakeville Fire Department. These projects were identified by Fire Chief Scott Garrigan and brought to the Legislator’s attention in 2015. The thermal imaging camera will be used to provide enhanced capability for firefighters in detecting hazardous heat levels at emergency scenes and save lives. 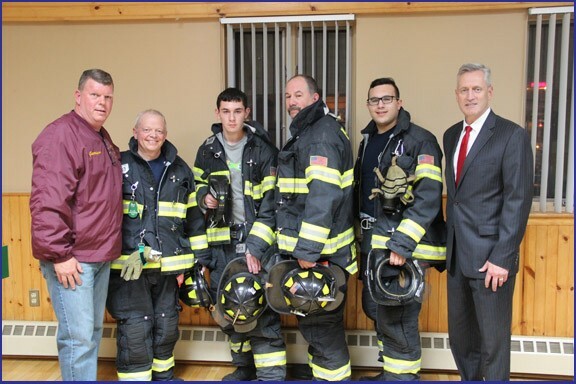 Shown in the photo above, from left to right are: Chief Scott Garrigan, firefighters Charles Stepanek, Brett Rabinowitz, Keith Rabinowitz, Joseph Longa, and Legislator Nicolello.